Georgina from our Oceans & Islands team visited some of the gorgeous Caribbean islands and found time to relax and enjoy once on the beautiful island of Grenada. This is what she thought…. Our whirlwind tour of 4 Caribbean islands, so far has been pretty busy! 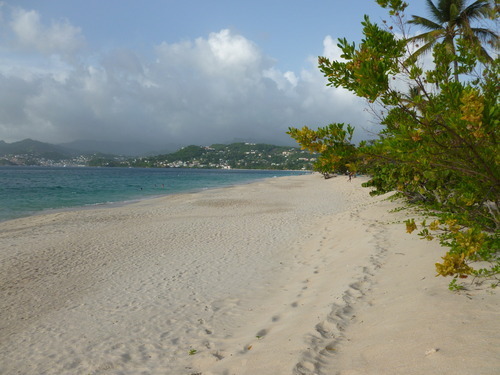 So when we arrived on Grenada, with a bit more time on our hands, we instantly relaxed. Straight from the airport, we went to see Laluna, just 10 minutes away! This island is quite small so most hotels in the south have a 10-minute transfer time. Laluna is a lovely rustic boutique hotel with a Balinese theme; it is right on the most beautiful bay, with the bluest water you can imagine. The rooms are quite rustic but original and comfortable, all with plunge pools, the less expensive rooms are quite high up on the hill – so a bit of a hike, but the views are stunning. Our next stop was Mount Cinnamon, a very different set up with lovely villas all on the hill, overlooking the amazing Grand Anse Bay. The villas are stylish and colorful, with huge brightly colored SMEG fridges, full kitchens and laundry facilities. 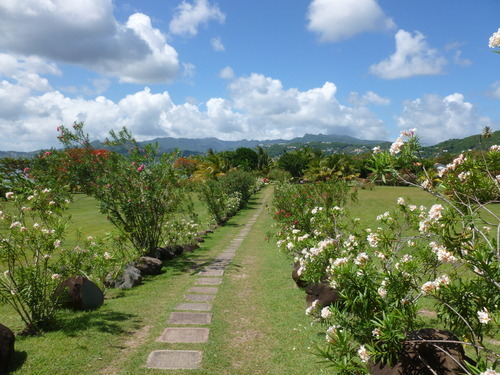 It is just a few minutes’ walk to the beach through lovely gardens. The beach bar does lovely salads and burgers, grilled seafood and fish & the nutmeg ice cream is amazing! The last stop for the day is Calabash, settled in a lovely bay where you can see lots of boats bobbing around in front & the water is a lovely blue. This hotel has a Gary Rhodes restaurant, which has a lovely atmosphere and really good food, bringing a bit of Caribbean flare into the international food. The chocolate and banana pudding is insanely good! 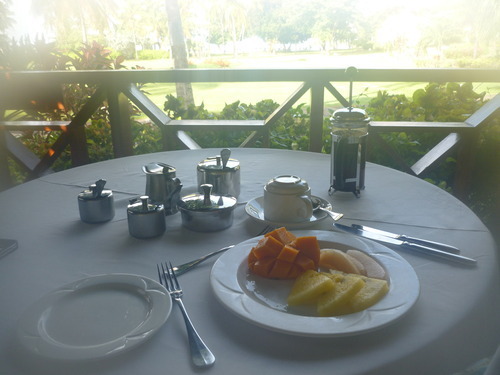 One little thing, which is a lovely touch, is the a la carte breakfast set up on your balcony each morning. The day before, you just tick some boxes on a little white form, and this will all be delivered at your chosen time. A real luxury if you don’t fancy having to get out of your dressing gown! From there our lovely friends at St James Travel (our eyes and ears on the ground!) picked us up for an island tour. We drove north through the capital St George’s, a vibrant little town with lots of brightly colored houses, a few old colonial ones as well, and a giant cricket stadium! We stopped off at a local market to pick up some spices to take home, after all Grenada is the “Spice Island”! We drove further Northeast into the rainforest, stopped off at a small waterfall, where we were serenaded by a Bob Marley look alike… The rainforest was a lovely break from the very hot weather we had experienced so far – we passed by a lake, so deep apparently no one has ever found the bottom… we drove a full circle back around the East Coast and ended up in the south again, where we checked into Spice Island. 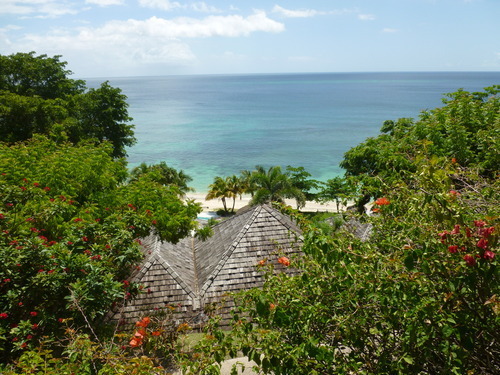 Spice Island is a hidden gem, right on the beach – the beach front rooms literally open up to the white sand of Grand Anse Bay. It is an all-inclusive property, and it does it really well. The food really is great and there is lots of choice each evening with a daily changing menu. The rooms are extremely comfortable and stylish, the ones set back from the beach have a private pool where the beach front ones don’t have pools but the sea view and terrace with hammock make up for it! 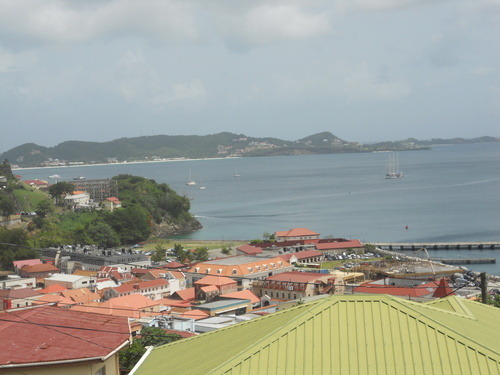 Grenada is the real Caribbean – rustic, lively, vibrant and fun! It is a pretty island with amazing beaches, turquoise water, great food, rainforest and lots more, definitely one of my favorite islands so far.